The other day Franci and I were talking about subjects we studied in high school, and Marica asked what “calculus” was. Franci said it was a type of maths (Marica’s been learning her written numbers). Marica of course replied that “she could do that”, but Franci said she was probably a bit young for calculus. That was enough of a challenge for me, so I decided to give Marica her first calculus lesson. 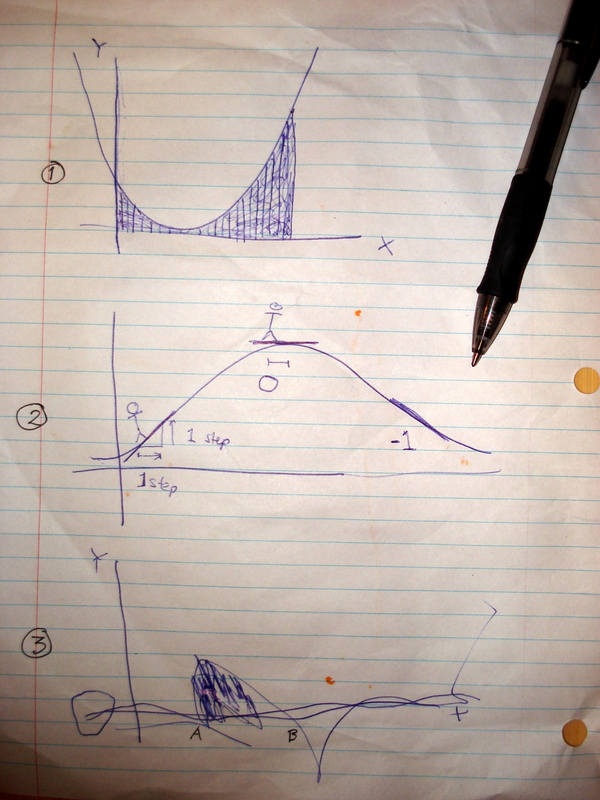 If you keep it graphical and leave out the algebra, calculus is actually a fairly simple subject — areas under curves (read “colouring in”) and slopes (“going up and down hills”). Below is a photo of our worksheet. Diagram 1 is me showing her how to do integration. In diagram 2 I’m explaining differentiation. And in diagram 3 I asked her to draw a curve, and then calculate the area under the curve from point A to point B using graphical techniques (she did a pretty good job). Thanks for the encouragement – as we get back into formal schooling – that, no, calculus is not so hard! At least the concepts aren’t…. What do you reckon she’ll think of Statistics “Pie Graphs”? !